I’m pretty sure if you were to type those words into Pinterest right now, hundreds of results would come up. And some of those results could be great resources. But a lot of them will just tell you want steps to take and not actually walk you through them, let alone give you personal support through the process. Your other option would be to pay someone to do it for you. But let’s be honest. Make sure you have a pretty penny saved up for that one. Easy? Yes. But cheap? No way. Not if you want it to look nice, at least. So how exactly did I get my blog to look this way? First, let me start off by saying, I definitely don’t think my blog is perfect. There is a lot I’m still learning. But I’m pretty darn happy with my progress. To think I went from a random blogspot blog to this within a week, well that’s pretty darn good. What I used to build this blog was an all-in-one program. It gave me step-by-step videos showing me exactly what to do, from domain names, to hosting, to themes, and even setting up my free guide. It was by far the best program I’ve found for starting my blog. I love that it made it so simple, but I still was able to learn and customize it myself. I still built it myself, so now I know how to edit and change things, but it paved the way for me. With this course you also have access to a private facebook group, which let’s be honest… I’ve used on more than one occasion to ask questions. It’s called The Ultimate Branding Blueprint by Tanya Aliza. 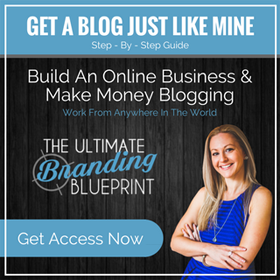 She breaks everything down in a step-by-step formula to build your own blog. Check out her short video on How to Start a Blog in only 5 minutes. Or if you’re impatient (like me) and you’re ready to get started, head on over here. If you’re still unsure, or just want to ask me some more questions, feel free to e-mail me at Kaciewdeleon@gmail.com or message me over on Facebook. **This post contains affiliate links. But trust me when I say, I wouldn’t be recommending if I didn’t believe in it. These links help support my stay-at-home mom business. You can choose to use them or search on your own.